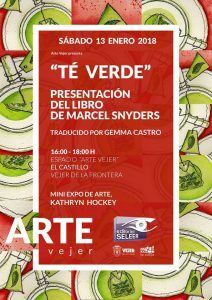 On a rainy January afternoon my friend Marcel Snyders presented his play ‘Té Verde‘ (Green Tea in English) to an enthusiastic audience in the castle headquarters of Arte Vejer. 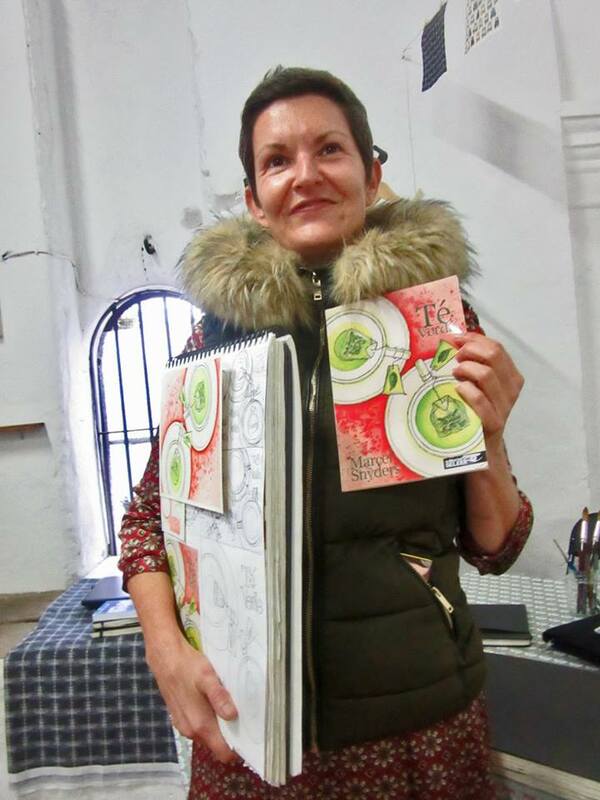 I designed the front cover for Té Verde back in October 2017 (you can read about the process here) so Marcel invited me to exhibit some of my art work during the event. 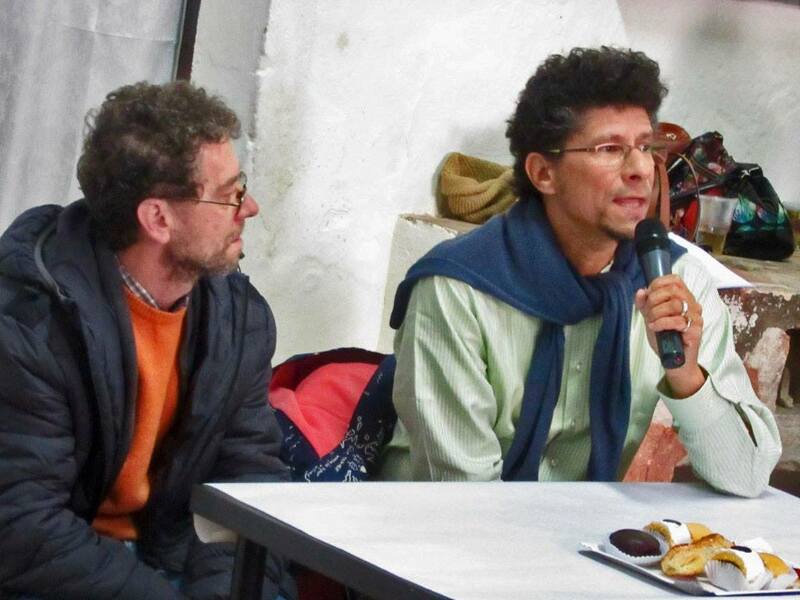 That’s Marcel (below) being interviewed by Paco Ariza Varo from Radio Vejer before Marcel interviewed me…. 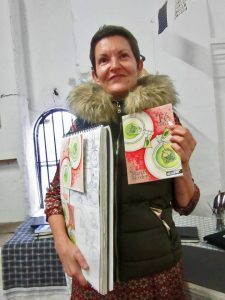 Annie B’s Spanish Kitchen Christmas cards from 2015 and 2017. 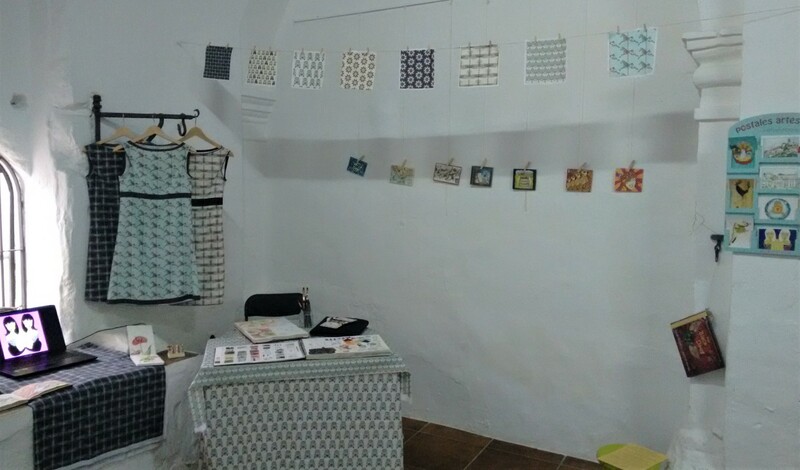 I also displayed some of my fabric designs (my current favourite form of illustration!) 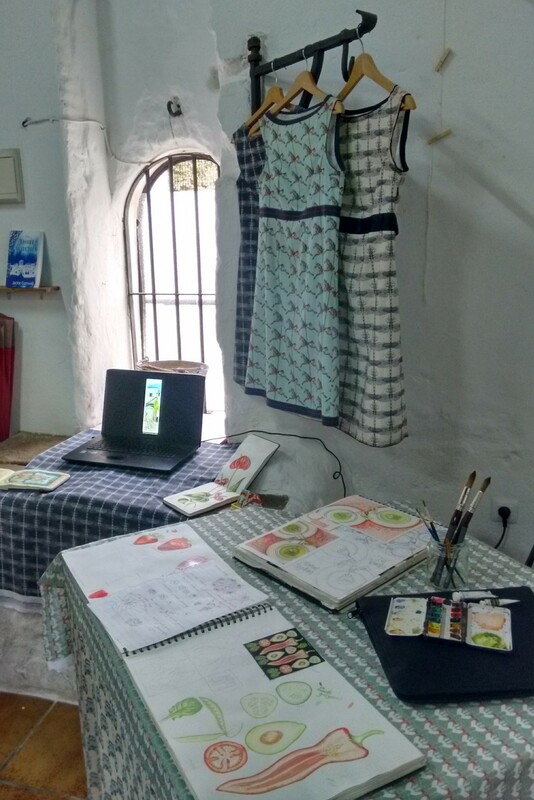 and the dresses I made from them, as well as a selection of postcards and a computer slideshow of other artworks. 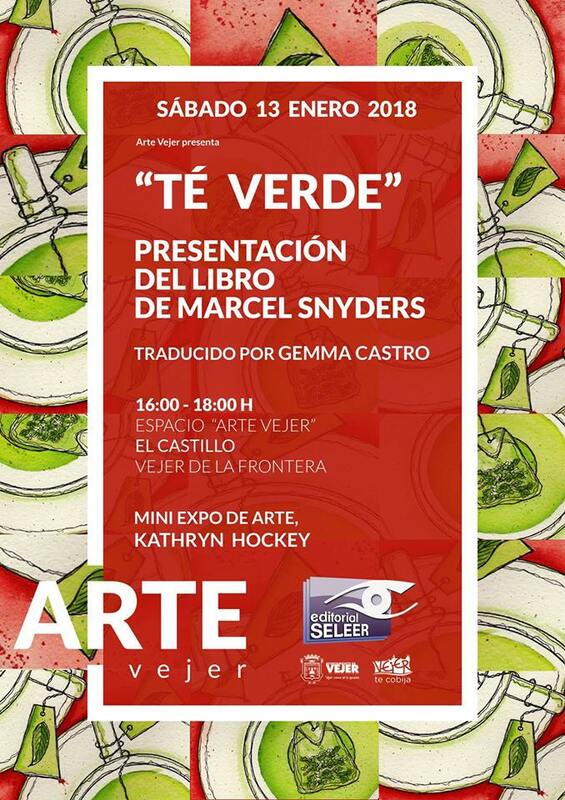 The Spanish version of the play Té Verde is now available to buy on the publisher’s website. 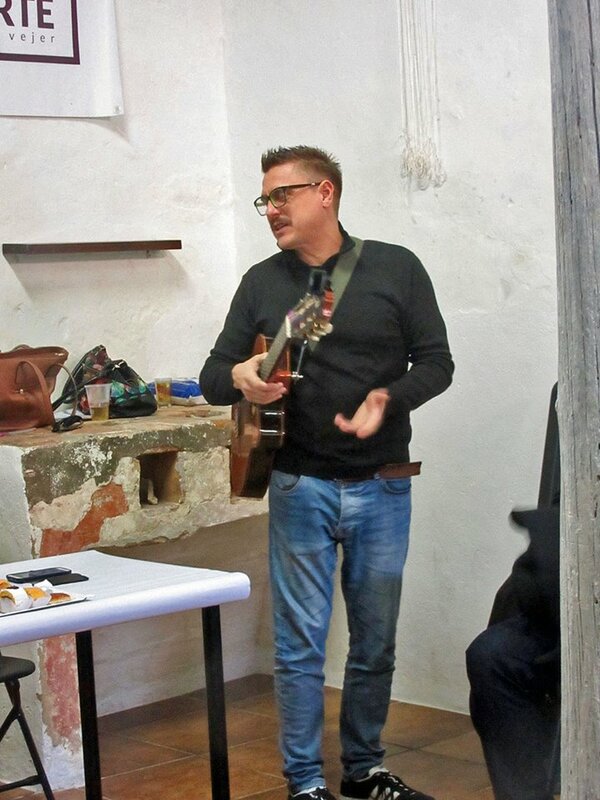 It’s a highly entertaining read…Good luck Marcel! 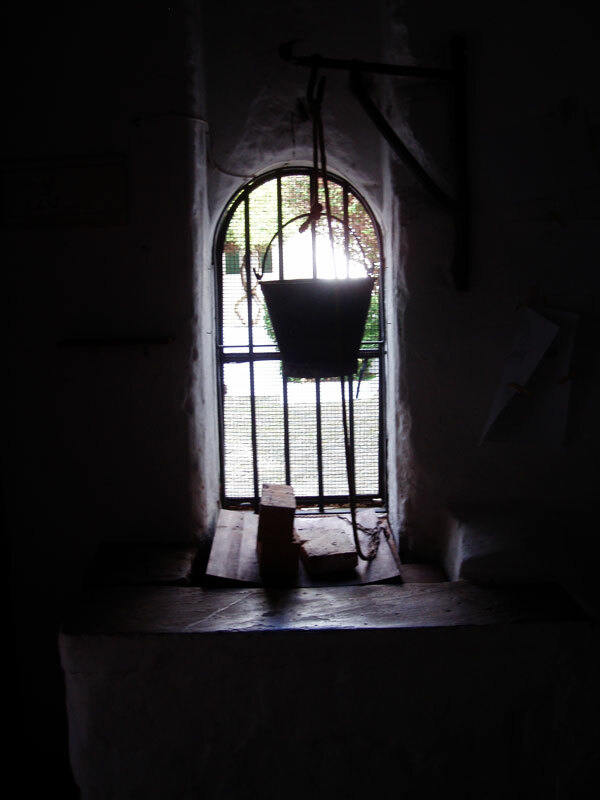 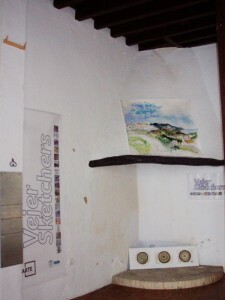 Some time ago Arte Vejer invited me to run an art workshop in their castle headquarters. With no previous teaching experience I wasn’t sure what I could offer, then I remembered all the people who’d told me that they’d like to come out and draw with the Vejer Sketchers but are out of practice or lack confidence or find drawing stressful…or all of the above. 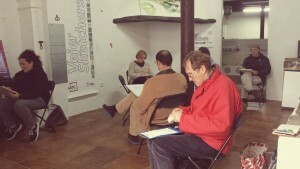 It then occurred to me that as a regular sketcher I do have some tips and tricks to share that could make the whole experience more fun and relaxed. So having listed my tips and tricks in English and translated them into Spanish I had my workshop plan, and here we are discussing them. 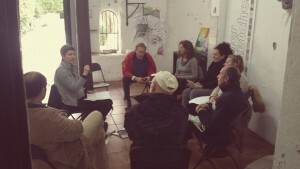 The group then dispersed to sketch whatever caught their imagination and put some of the ideas into practice. 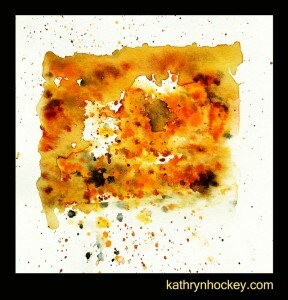 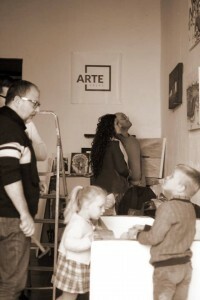 Feedback was very positive and I might very well run another workshop in the not too distant future. I do truly believe that anyone can draw; it’s a matter of confidence, regular practice and being relaxed enough to shelve your expectations, to revel in the experiments your materials offer and to willingly ‘ruin’ those pristine paper sheets. 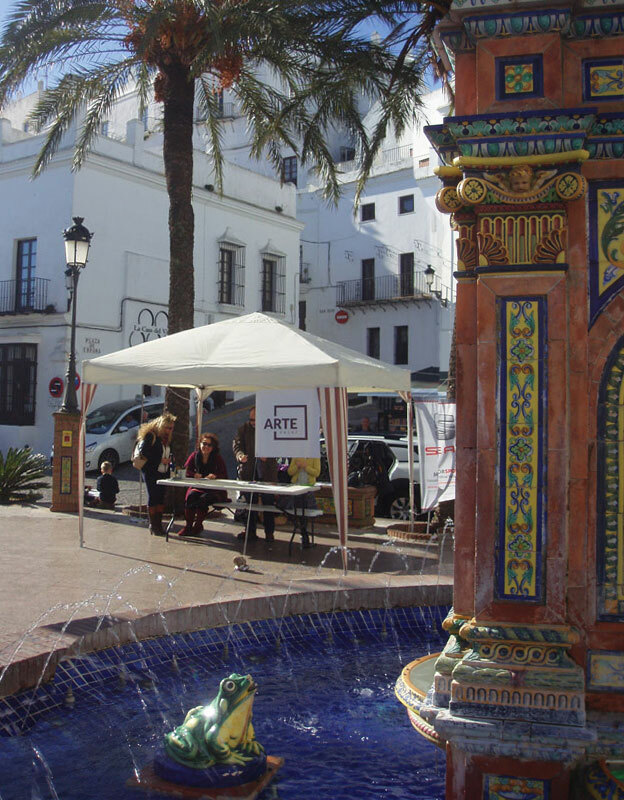 Arte Vejer has certainly had a busy few weeks. 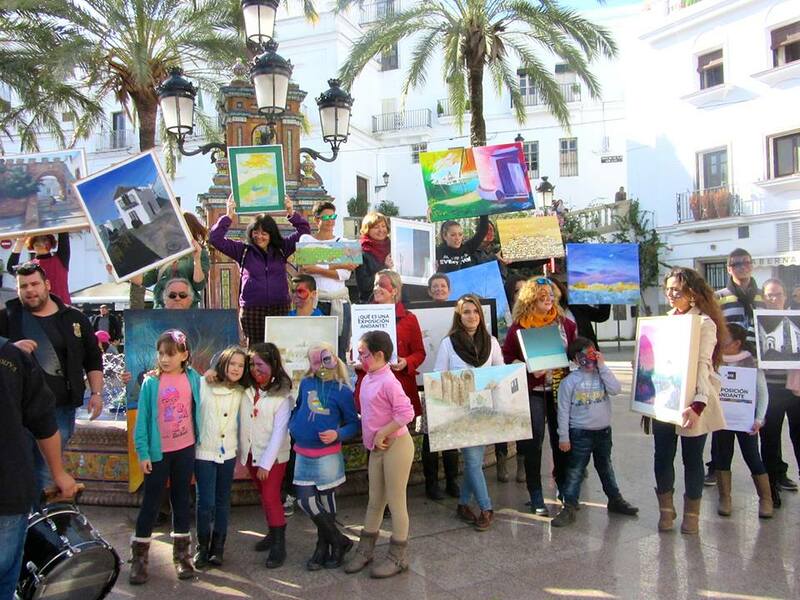 The community group which promotes visual arts and creativity in the Vejer de la Frontera region has really been going for it as you’ll see and read below! 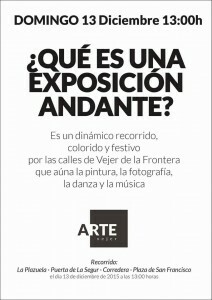 What is a mobile art exhibition? You might well ask…I had no idea before taking part on Sunday 13th December. 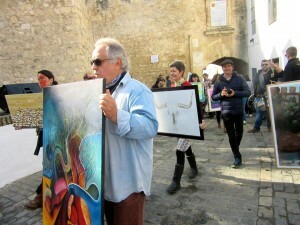 It turned out to be as dynamic, colourful and festive a procession through the streets of Vejer as the poster promised. 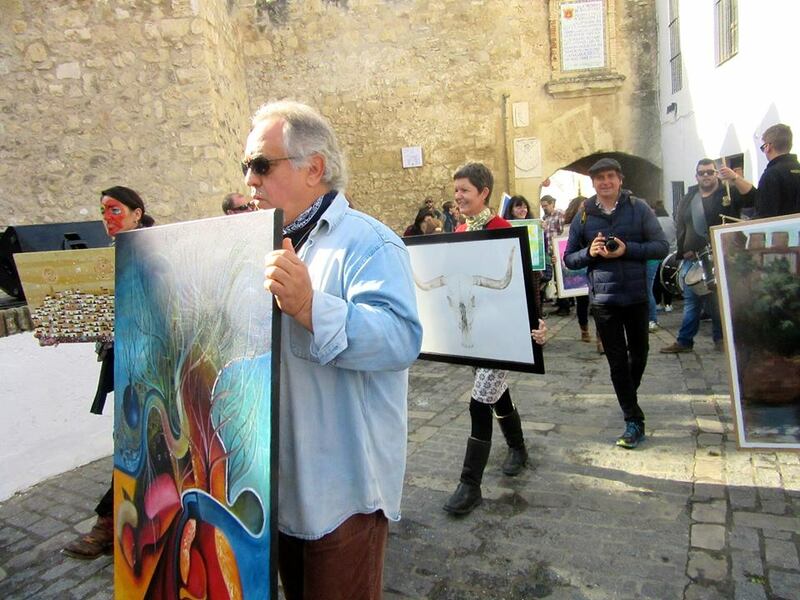 Sol Muniain (right), a truly gifted artist and the inventor and driving force behind the Arte Vejer mobile art exhibition unlocks the door to the castle for a session of painting faces Picasso style prior to the procession. 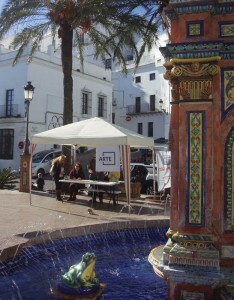 Sol paints the face of Ismael Virués, another dedicated Arte Vejer organiser and the banner bearing leader of the art parade. 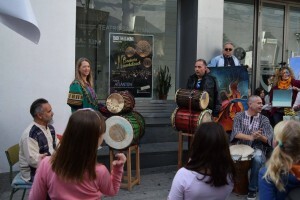 Having picked up the art works we were joined by a band of marching drummers and set off around town. 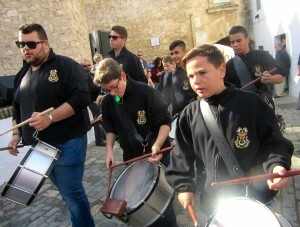 The drive and energy exuded by the marching drummers was amazing, especially when the parade passed through the narrowest alleyways and the rhythm really bounced off the walls. 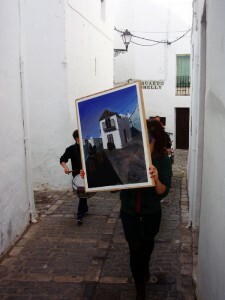 It was also quite surreal to look back and see a view of Vejer within a view of Vejer. 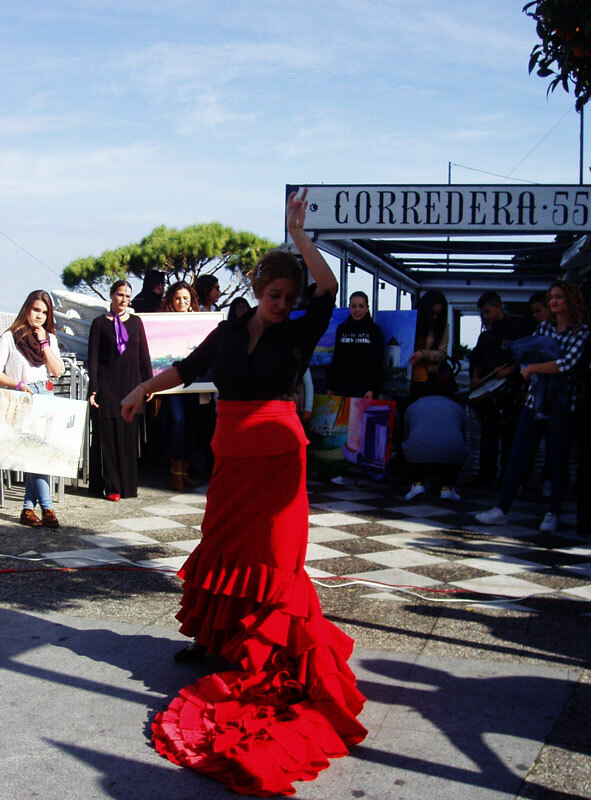 We made several stops en route, here we are in the Plaza de España for a photo opportunity…..
…more flamenco dancing on La Corredera…. 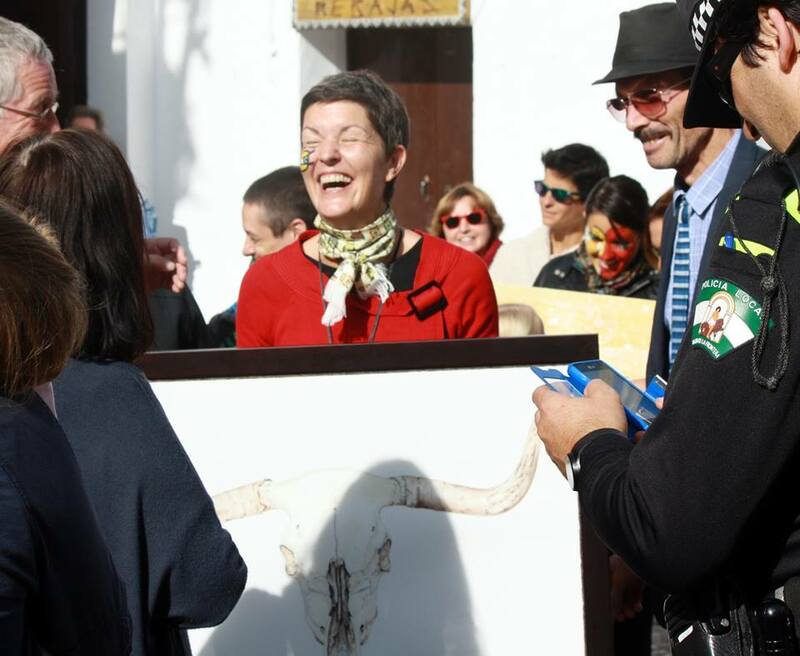 …and returning to La Plazuela with tired and happy arms (and no, despite the crazed expression, I did not get arrested)…. 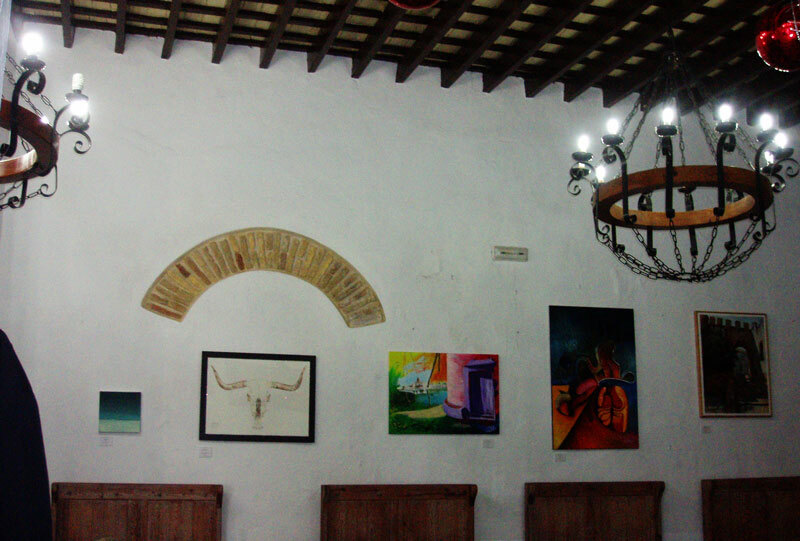 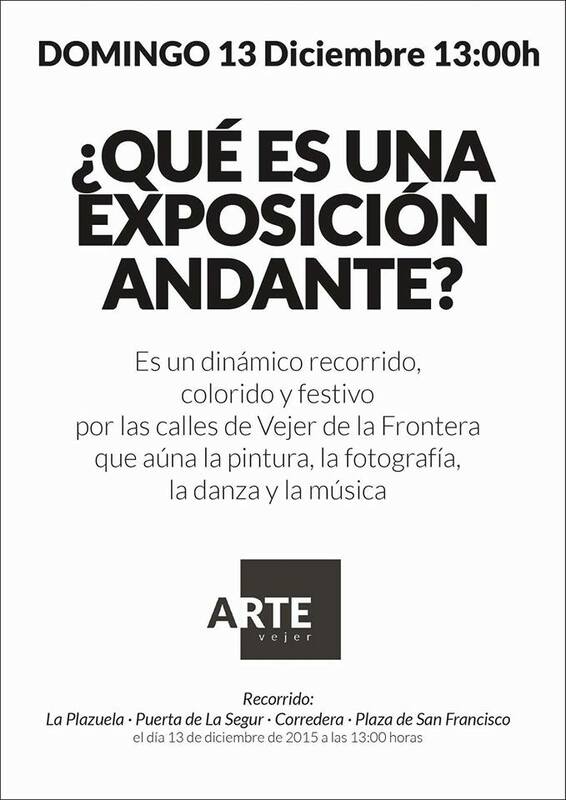 …before replacing the artworks on the walls of the Hotel Convento San Francisco where they will rest, for sale, until January 10th 2016. I was delighted to have my artwork accepted for the mobile exhibition and feel priviledged to have taken part in such an extraordinary event. 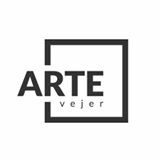 Many thanks again to Arte Vejer for the huge amount of work and good will which went into coordinating all the art forms so beautifully and happily. Click here to see yet more photos of the event on facebook, thanks to Jackie Cornwall. 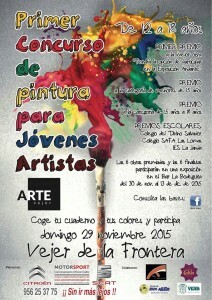 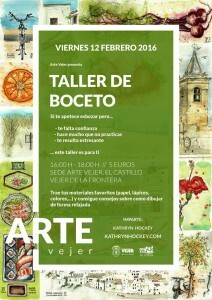 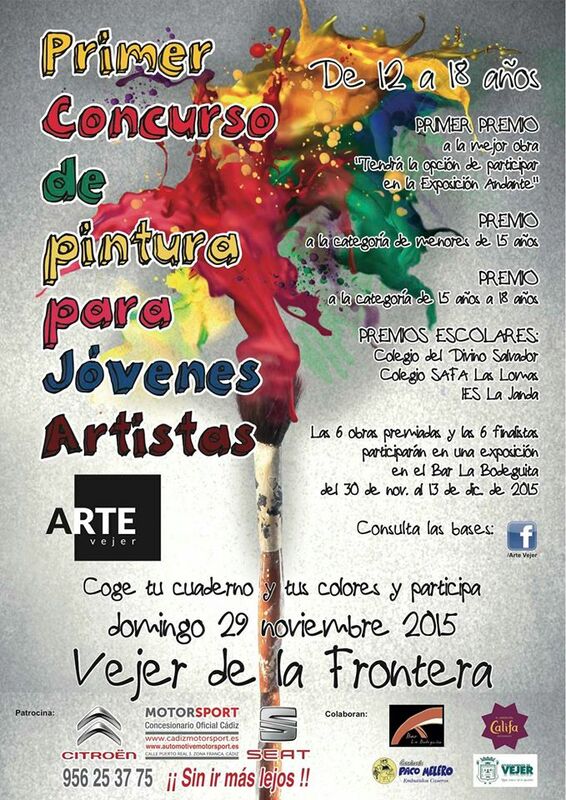 On the 29th November Arte Vejer staged the first ever painting competition for young artists in Vejer. 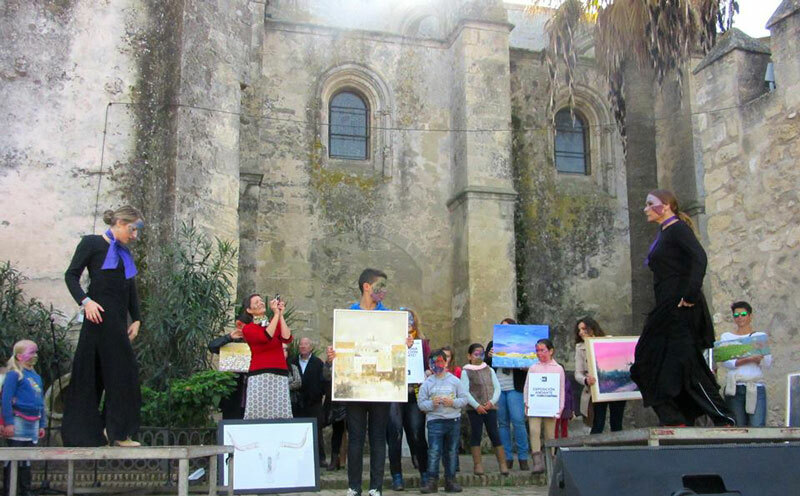 I was honoured to be invited to join the judging panel and was really impressed by the high standard of the artworks produced. About 30 participants signed up to the competition in Vejer’s beautiful Plaza de España and then dispersed to various parts of the charming old town to work on their paintings and drawings for several hours. Click here to see photos of the event and the impressive range of artworks; the overall winner has her painting included in the (previously mobile) Arte Vejer exhibition in the Hotel Convento San Francisco and the other prize winning works are currently displayed in La Bodeguita, a local bar. The 6th December was pueblo abierto (open village) day for Vejer, which coincided with the ruta de tapas. Arte Vejer celebrated its recent allocation of a room in the castle by the town council by mounting an exhibition of members’ work there and including the non-prize winning works from the young artist painting competition. 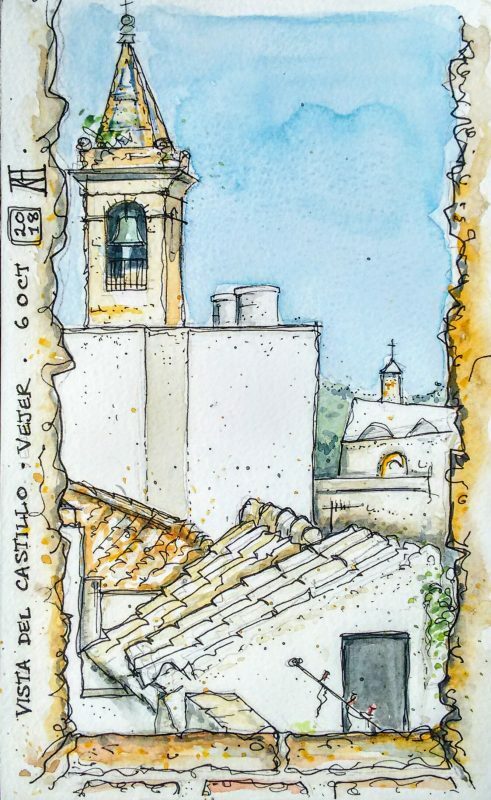 I made this pen and watercolour sketch (right) of the castle patio while sitting on the doorstep of Arte Vejer’s room and then went up to the ramparts to make an abstract watercolour sketch (below) inspired by the lichen which adorns many roofs and walls in the old town. 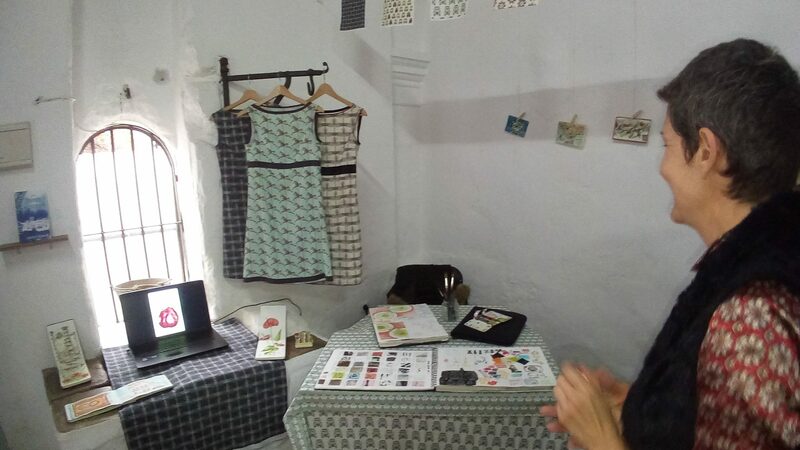 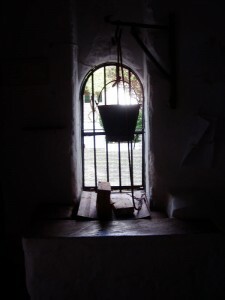 As well as an exhibition space the castle room will be used as a venue for creative workshops. 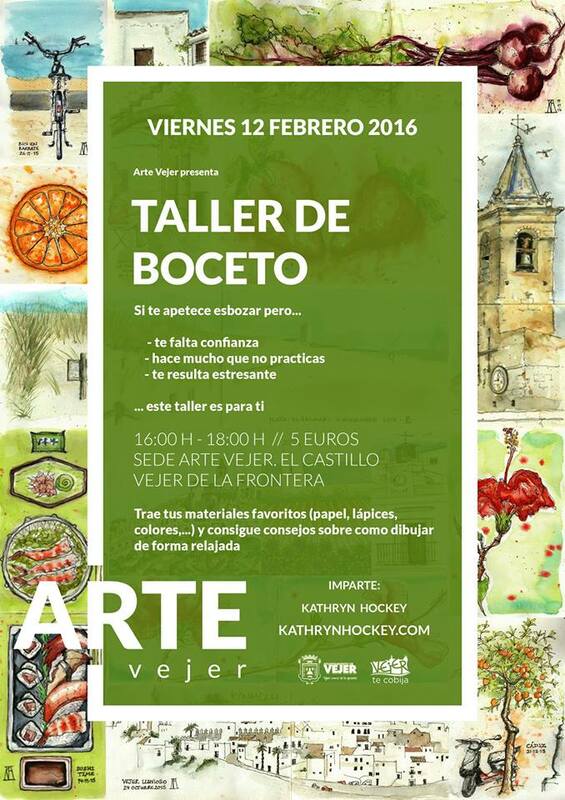 I’m planning to host one early in 2016 for adult sketchers who are a bit rusty and lack the confidence to come and draw with the Vejer Sketchers group. 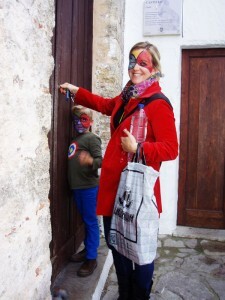 If that’s you, please get in touch!